Soccer Dryers- Solution to Wet and Stinky Soccer Cleats and Soccer Gear! There is a solution to wet and stinky soccer cleats, shin guards and goal keeper gloves. It is called Soccer Dryers from www.SoccerDryer.com. They feature two models to dry out your soccer gear. The Soccer Family Dryer which is a 4 soccer garment dryer which can dry a pair of soccer cleats and shin guards simultaneously. 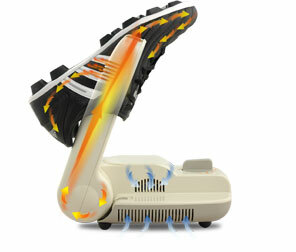 The second model is the Soccer Player Dryer which dries out 2 soccer garments. Both Soccer Dryers eliminate wetness and odor in 2 hours or less. They work great and each model has a timer- so we just set the timer and our gear is dry and ready to go when we are ready for our next practice or game. Because cleats and gloves are closed end garments they do not dry well without the aid of dryers. The forced air is heated at body temperature (98 degrees) they will not damage or harm the leather or material of the soccer gear. Great products and a "must have" for the serious soccer player or tournament participant. Highly recommend visiting their site at www.SoccerDryer.com ! Join in and write your own page! It's easy to do. How? Simply click here to return to Favorite soccer cleats.